Sorry for my absence the last couple of weeks. I'm in the middle of changing jobs and working on a grad thesis, which hasn't left a lot of time for gaming. In any case, let's get back to some World at War goodness! Thanks to a comment from Pascal, I'm going to do a short article on Assaults and Overruns, two very important aspects to the World at War system. Recently, I've been covering the basics of World at War for all the new players jumping into the game. Up until now, I've given some examples of play, talked about HQs and also given a short primer on Line of Sight (LOS). So let's get into the real meat of the game, which is all about crushing your enemies, seeing them driven before you and hearing the lamentations of their women. First off, it's essential to understand the counter layout for units in World at War, so let's take a look. Here's something that I messed up many times when I was learning World at War and still occasionally manage to do even now: Line of Sight. On the face of it, Line of Sight (also known as LOS) seems pretty simple but there are just enough nuances to it that it can mess up a World at War newbie once in a while. Let's step through it slowly and with plenty of examples, shall we? First off, LOS is always reciprocal. So if I can see you, you can always see me. Above, we have a very basic situation. The T-64 and the Abrams have nothing in between except clear ground. They both can see and fire at each other with no problem. They both have LOS to each other. 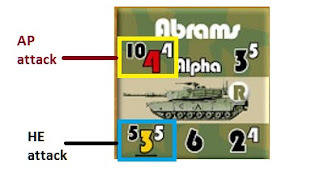 Here above, we have a situation where LOS is blocked between the Abrams and the T-64 by the town (W13). LOS is also blocked between the Abrams and the Shilka by the Forest hex (X10). As part of my ongoing tutorial on World at War basics, I thought I would talk about how different units function as part of the World at War universe. Let's start with the HQs! Every formation has an HQ and these are used to issue commands to all other units in the formation so they can move, fire, etc. HQ counters are clearly marked as such at the top of the counter. HQ counters have two sides: full strength and reduced. Full strength markers can be identified by the darker color band around the picture of the unit in the center of the counter. Reduced HQs can be identified by the white band surrounding the unit picture in the center of the counter.